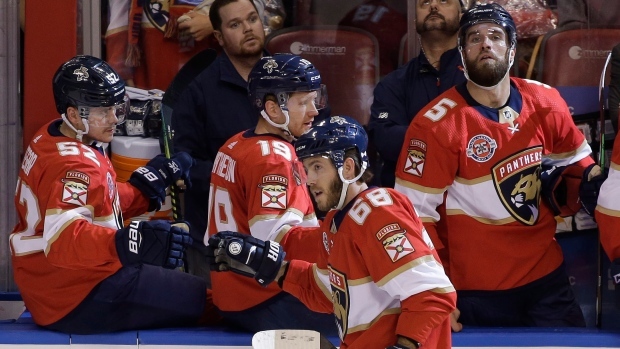 SUNRISE, Fla. — The Florida Panthers' top line keeps carrying the team. NOTES: The Panthers have two 80-point players for the first time in franchise history IN Barkov (87) and Huberdeau (82). ... Keith Yandle's second assist on the Hoffman goal set a Florida franchise record for points in a season by a defenceman (58). ... C Jayce Hawryluk returned after missing three games with a lower-body injury. ... Coyotes D Jason Demers played his 600th NHL game. ... UFC stars Yoel Romero and Jacare Souza dropped the ceremonial puck before the game.